Packet pick up will be Saturday, November 14, 10:30 am-to-5pm, in the lot next to the transition area with a mandatory bike check in that day. There will NOT be an expo at this year’s race, but Bob’s Bike Shop will be onsite to assist with any needs both during bike check in on Saturday and .race morning. Transition area will be secured by event staff during the day and by a Brevard County Sheriff’s Deputy team overnight. Bikes will be checked into transition on Saturday during packet pick up hours or Sunday morning. There will be all day and overnight security on Saturday. 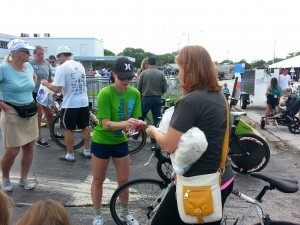 There will be bike racks set up in the grassy area near the packet pick up and expo tent. Please rack your bike or leave it on your car before getting on line. You will need to have your hands free for the check in process and it will reduce wait times for everyone. You may check your bike in on race morning, but there will be no race morning packet pick up. You will also be body marked on Saturday. Transition will be open 5:30am – 6:45am. ALL athletes must be out of transition after that time. This is for the safety and security of all athletes and their property. You will receive your timing chip at the exit side of the transition area on Sunday morning.